At 29 years old, the Connecticut born singer charted his sole top 40 single, a soulful tune that was originally recorded and released by Olivia Newton-John on The Rumour in 1988. Hugh’s song also went top ten on Adult Contemporary radio. The Canadian duo of producer Barry Harris and singer Kevin Wynne danced their way onto the charts with this energetic club track, sampling Lynn Anderson‘s 1971 crossover hit “(I Never Promised You A) Rose Garden”, among other cuts. 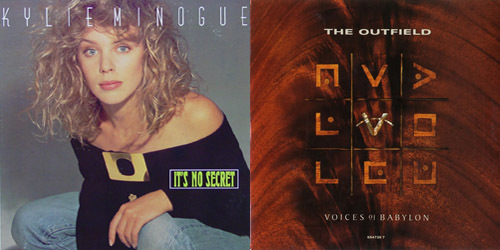 Well, it is no secret that Minogue should’ve been treated better by the U.S. market; alas, three singles from Kylie did rank on the national pop charts. The track is a great pop gem, but following “The Loco-Motion”, this one derailed the era here. From the small screen of Kids Incorporated to the big boom of the music industry, “More” went top 40 before this young singer turned 20. She’s best known for its followup, single “Toy Soldiers”, an emotional ballad that spent two weeks at #1. Ten years after launching a pair of singles into the top 20, 1979’s “Crazy Love” (#17) and “Heart Of The Night” (#20), the California supergroup, with a lead vocal by Rusty Young, made an unexpected comeback, but one of the best of the year. Led by singer Andrew Roachford, the initial release of “Cuddly” in the United Kingdom was a dud, only reaching a high of #61. The second time out, it went to #4 and led to a Stateside release. Their top 40 days continued in the U.K. until 1998. Long forgotten by the U.S. charts, this amazing Motown throwback was a hit across some European countries in late 1988 before crossing here the next year to minimal results. The duo continued to release music in Europe though the mid-90’s. First a hit in the U.S. for The Dixie Cups (#20) in 1965, this version was originally released in 1982 before breaking out here in 1989 thanks to its inclusion in the successful film Rain Man. However, the septet was disbanded during its reissue. Everyone sings along to the classic “Your Love”, their enduring top ten hit from 1986, but this is by far my favorite single from the English trio (now performing as a duo.) Though the album of the same name didn’t sell well, the song is a winner. With a 40-position survey, this one didn’t quite make it onto R&R, but it did well with the college crowd and spent several weeks at #1 on the Modern Rock chart. The English quintet stayed together for three decades, but officially split in 2006. Do you have a favorite underrated 1989 single from the selections above or one that I didn’t mention? Comment below or click the “Get Social!” tab to find PGTC on social media.